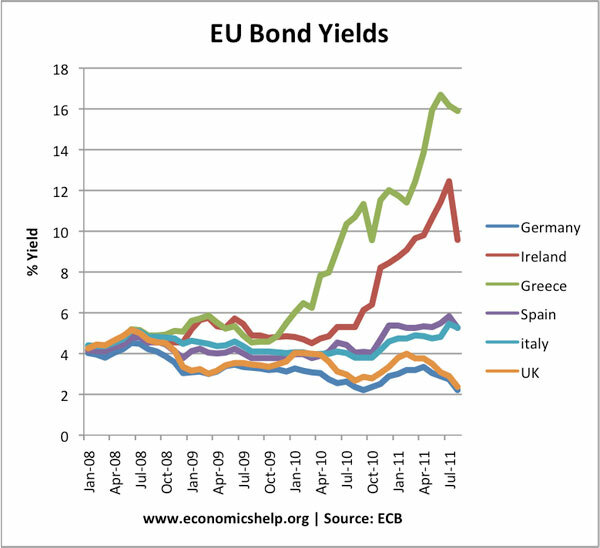 Since the financial crisis the bond yields in many European countries have diverged. For example, in Greece which has government borrowing of over 100% of GDP, bond yields are now significantly higher than German bond yields. The higher bond yields on Greek debt reflects the fact, investors are more nervous about buying Greek bonds because of the greater possibility of debt default. Note in these statistics from Economist, Irish government borrowing is only 25% of GDP, but since 2007 Irish borrowing has increased sharply because of recession and bank bailouts. Suppose the ECB wanted to pursue quantitative easing in the Eurozone; this would involve buying government bonds to drive down long term interest rates. Clearly it would be a great boon for Greece if the ECB bought their government bonds; the yields would decrease, people would have more confidence in Greek debt and the inflationary impact of expanding the money supply would be limited by the size of the ECB and other countries fiscal restraint. You can see how politically sensitive it would be for the ECB to decide which government bonds to buy. Do they buy bonds in countries with the highest interest rates, or do they have to buy bonds equally in all countries. Unsurprisingly the ECB is trying desperately hard to avoid even contemplating this unorthodox monetary policy.